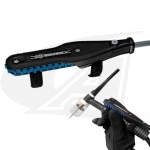 Velcro Style Strap-On North / South rotary motion controls are versatile and allow you to mount controls to any TIG torch handle. These lightweight yet durable, amperage controls feature a low-profile design for better comfort and increased productivity. Each control ships with replaceable cover plates and can be configured for right or left hand operation. 15' (4.5m) , 28' (8.5m) and 53' (16.1m) control cables provide greater flexibility and can be readily upgraded to longer cables as needed. Custom length control cables are available upon request.